The French Socialist Party held the first round a presidential primary to select a candidate for the 2017 presidential election on 22 January 2017, and will hold a runoff on 29 January between Benoît Hamon and Manuel Valls. It will be the second open primary (primaires citoyennes) held by the center-left coalition, after the primary in 2011 in which François Hollande defeated Martine Aubry to become the Socialist nominee. Hollande went on to defeat incumbent Nicolas Sarkozy in the 2012 presidential election. However, because of his low approval rating, he announced that he would not seek re-election, becoming the first president of the Fifth Republic to decide not to run for a second term. The primary is contested by seven candidates, four from the Socialist Party and three representing other parties part of the left-wing electoral alliance (la Belle Alliance populaire). The three frontrunners in the primary are Manuel Valls, who served as Hollande’s Prime Minister from 2014 to 2016 and interior minister from 2012 to 2014; Benoît Hamon, Minister of National Education in 2014; and Arnaud Montebourg, Minister of the Economy, Production Recovery and the Digital Sector from 2012 to 2014. On 22 January, Hamon received 36.35% and Valls 31.11% of the vote in the first round and advanced to the runoff, far ahead of all other candidates and well ahead of Montebourg, who was eliminated and immediately endorsed Hamon. The selection of the candidate of the French Socialist Party (PS) by activists was planned since the adoption of statutes at the Epinay Congress in 1971, and the PS ran closed primaries, among party members only, before the 1995 and 2007 presidential elections. In June 2010, prior to the 2012 election, the party decided to open the primary to all citizens, and not only members of the PS, and in October 2011, it held its first open primary which led to the selection of François Hollande as its nominee in the subsequent election, won by the PS. In the party’s Toulouse Congress following the 2011 primary, the principle of open primaries for future presidential elections with the involvement and support of other left-wing political parties was adopted. Given the unpopularity of incumbent president Hollande, discussions were held regarding the possibility of a primary before the 2017 election and its parameters. In February 2016, the First Secretary of the French Socialist Party, Jean-Christophe Cambadelis, publicly indicated his support for a primary election within the party. The primary was announced on 19 June 2016. It is the first time a party with an incumbent president has held a primary election for over 50 years. Europe Ecology – The Greens, the Communist Party and the Left Party, as well as smaller left-wing parties, will not participate in the primary. However, the Radical Party of the Left and the Union of Democrats and Ecologists will participate. On 17 December 2016, after the close of nominations two days earlier, the High Authority for the French Left Primary declared that the nominations for seven candidates had been validated: four candidates from the Socialist Party, the leaders of the Union of Democrats and Ecologists, the leader of the Democratic Front, and a member of the Radical Party of the Left. The primary was held against the backdrop of the unpopularity of the ruling Socialists and the fragmentation of the left between three major candidates, with polls indicating that the party’s candidate would come in fifth, behind the National Front‘s Marine Le Pen, François Fillon of the centre-right Republicans, Emmanuel Macron, former economy minister under Hollande who founded his the centrist political movement, En Marche!, and far-left ex-Socialist Jean-Luc Mélenchon under the banner of Unsubmissive France. 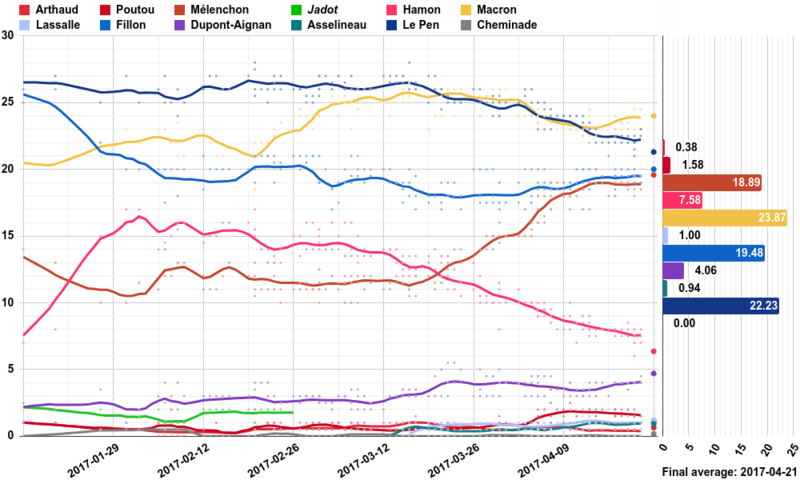 With left-wing votes split between Macron, Mélenchon, and the Socialist candidate, none is likely to advance to the second round. Macron, the “third man” in the French presidential election and a protegé cultivated by Hollande, founded En Marche! in April 2016, seeking to bridge a “left-right divide” and positioning himself as a liberal economic reformer left-wing on social issues. Like Macron, Mélenchon has become a stalwart critic of Hollande and his Socialist government, and his bid presents a further threat to the electoral success of the Socialists in the election. Despite the Socialists facing the prospect of a humiliating defeat, both Macron and Mélenchon refused to drop their presidential bids, and the Socialists remain insistent on fielding a presidential candidate. Former economy minister Arnaud Montebourg, who also ran for the nomination of the Socialists in 2011, was one of the first to declare interest in a speech at Mont Beuvray on 16 May 2016, widely viewed as indicating his interest in running for the presidency, in which he issued a “call” to “build” a “great alternative project for France” to an audience of 200 Socialist Party militants. Among those in attendance were former minister Aurélie Filippetti, as well as MPs Christian Paul, chief among the party’s rebels, having had a part in the foundation of the New Socialist Party caucus along with Montebourg, Laurent Baumel and Patrice Prat. Montebourg officially declared his candidacy on 16 August, decrying Hollande’s betrayal of the “ideals of the left” in Frangy-en-Bresse in his home département of Saône-et-Loire, and laid out an anti-globalization campaign platform based on protectionism for French businesses, threats to nationalize predatory banks, and tax breaks for the middle class, themes which became central to his campaign. These themes were reflective of his combative tenure as economy minister, in which he threatened to nationalize divisions of ArcelorMittal and attempted but ultimately failed to to prevent General Electric‘s partial acquisition of French multinational Alstom. Former French education minister Benoît Hamon, another founder of the New Socialist Party caucus, declared his candidacy on the same day, arguing that Hollande could “no longer earn the French people’s trust” and proposed to raise the minimum wage, to further reduce the 35-hour workweek instituted by the Socialists in 2000 to 32 hours, a €35 billion stimulus for the French economy, and legalizing marijuana. His signature campaign plan, however, was his intention to introduce a €300–400 billion universal basic income program funded by a tax on robots, equivalent to a monthly income of approximately €750 per person. Like Montebourg, he was ejected from the Socialist government by prime minister Manuel Valls in a wider purge of left-wing dissenters after the fall of the First Valls Government in August 2014. On 1 December 2016, incumbent President François Hollande announced in a televised address from the Élysée Palace that he would not seek a second term in office, clearing the way for Valls to enter the race, who subsequently announced his candidacy on 5 December. Valls, Montebourg, and Hamon ultimately became the main three contenders for the Socialist nomination, but several other candidates ultimately participated in the primary. Former Minister of National Education Vincent Peillon made a late bid to become the Socialist nominee, announcing his candidacy on 11 December, returning from a two-and-a-half-year residency in Switzerland in which he taught philosophy at the University of Neuchâtel and wrote novels; his bid contrasts with those of Montebourg and Hamon, representing the mainstream Socialist Party as opposed to its left-wing rebels. Three other candidates, not of the Socialist Party, also ran in the primary as members of the parties of la Belle Alliance Populaire, a left-wing grouping. Among these were MP François de Rugy, representing the Ecologist Party which he founded along with Senator Jean-Vincent Placé after leaving the EELV in August 2015 over concerns about the party pandering to its left wing; Sylvia Pinel of the Radical Party of the Left (PRG), and Jean-Luc Bennahmias, who left the Democratic Movement to found his own centre-left party, the Democratic Front. Several other candidates also filed petitions to run in the primary, including Senator Marie-Noëlle Lienemann, Gérard Filoche, Fabien Verdier, and Pierre Larrouturou. Despite initially contemplating running, Lienemann decided not to run in the primary on 9 December, worried about the splitting of votes between candidates of the party’s left wing – Montebourg and Hamon – and urging them to unite forces. Although she stated that she faced pressure to withdraw her candidacy, these pressures were not a factor in her recusal from the primary. Filoche, a trade unionist, failed to secure the necessary number of sponsors to enter the primary (though he attempted to lodge a challenge against the decision of the High Authority), as did Verdier. Both men claimed that, because they represented other left-wing parties (Parti politique Filoche2017 and Convictions, respectively), they were not bound by the requirement to seek sufficient support, as with Pinel, de Rugy, and Bennahmias; nevertheless, the decision to exclude both was reaffirmed. Larrouturou’s application was rejected because his New Deal party was not a member of the left-wing alliance for the primary, as were those of Bastien Faudot of the Citizen and Republican Movement and Sébastien Nadot of the Movement of Progressives. Polling: Who was the most convincing candidate during this debate? The unpopularity of incumbent president Hollande led to widespread speculation as to whether he would choose to run for re-election, facing fierce competition within his own party in the Socialist primary; when he ultimately renounced his candidacy on 1 December 2016, he cleared the way for prime minister Manuel Valls to enter the field on 5 December.Valls, considered the “natural successor” to Hollande and whose attempts to modernize the Socialist Party have been characterized as similar to those of Tony Blair with the British Labour Party, earned a reputation for his law-and-order approach as prime minister, instituting business-friendly supply-side reforms and taking a tough position on migration, at one point even questioning whether Islam was compatible with the French Republic; all these views placed him well to the right wing of his party. Valls’ important role in Hollande’s government resulted in him becoming similarly unpopular, even within his own party and on the left. On 15 December, he declared that if elected president, he would abolish article 49-3, an executive degree enshrined within the Constitution of France. He controversially used it as prime minister to force laws through the National Assembly, bypassing legislative approval, to send them directly to the Senate, and his repudiation of the 49-3 was met with derision, Valls having used it to force through controversial labour reforms in the El Khomri law and the reformist Macron law, moves often described as indicative of his authoritarian tendencies. Valls further attempted to portray himself as a candidate “profoundly of the left” by backing down on his earlier tough tone towards labour, promising not to institute any further reforms to France’s 35-hour workweek – beloved by the French left – nor its labour laws, instead taking an anti-austerity tone; despite this, his campaign was overshadowed by past policies such as the abolition of the wealth tax. Valls’ most prominent opponent was initially considered to be former economy minister Arnaud Montebourg, who formally unveiled his platform in Paris on 3 January. The left-wing firebrand proclaimed that French employees should receive wage rises equivalent to executives’ in order to constrain corporate pay and called for a “supertax” on banks to raise €5 billion a year. Challenged by former education minister Benoît Hamon, who argued that the focus on economic growth and employment is misplaced, Montebourg argued that the prior was a “necessity” and claimed that he “challenged the theory of the end of work.” He also criticized a perceived European obsession with austerity, condemning it as the cause of the country’s persistently high rates of unemployment and dismal economic growth, promising to “liberate the French from European-imposed austerity.” He also pledged during the campaign that he would not comply with EU deficit rules, in contrast to Valls, embark upon an “economic patriotism” (described as protectionism by some observers), reserve 80 percent of government contracts for French small businesses, reinstate border controls, repeal the El Khomri jobs bill, defend small domestic businesses, warn that he might engage in a trade war against China, and support a €30 billion infrastructure plan. Montebourg’s months-long position in second place, however, was challenged by a surge of support for Benoît Hamon, with the primary becoming a three-man race between Valls, Hamon, and Montebourg by mid-January. Hamon’s strongly left-wing program of legalizing cannabis, taxing robots to fund a universal basic income, and to reducing the 35-hour workweek to 32 hours, attracted many left-wing voters disillusioned by the Socialists’ turn toward business-friendly policies, championed under Hollande’s presidency by the likes of Valls and Macron. The former education minister’s late rise was likened to that of François Fillon in the primary of the centre-right Republicans party, his rise propelled by his championing of left-wing values and vision of a society that spends less time working, enjoys higher pay, and emphasizes the importance GDP growth less. Hamon has also decried “neoconservatives” and “even those on the left” who wished to restrict the rights of French Muslims, a less-than-subtle denunciation of Valls’s hardline stance on immigration. His proposal for a universal income has been his signature policy; in the final primary debate, he insisted that it “creates work” and “allows employees to reduce their workdays, and it can further contract and eradicate poverty,” and post-debate polls indicated left-wing voters consistently viewed Hamon as being the most convincing candidate. Three debates were held before the first round of the primary. The first, syndicated by TF1, Public Sénat, LCI, RTL, and co-organized by L’Observateur, aired at 21:00 CET on 12 January, moderated by Gilles Bouleau, Élizabeth Martichoux, and Matthieu Croissandeau; the second, by BFM TV, RMC, and I-TV, aired at 18:00 CET on 15 January, moderated by Ruth Elkrief, Laurence Ferrari, and Laurent Neumann; the third, by France 2, Europe 1, LCP, TV5Monde, and regional daily newspapers, aired at 21:00 CET on 19 January, moderated by David Pujadas, Léa Salamé, and Fabien Namias. Should no candidate secure a majority in the first round of the primary, an additional debate will be held before the second round, syndicated between France Inter, TF1, and France 2 at 21:00 CET on 25 January, moderated by Gilles Bouleau, David Pujadas, and Alexandra Bensaid. The first debate attracted 3.83 million viewers, representing an audience share of 18.3%; the second 1.75 million, representing a share of 7.9%; and the third 3.07 million, a share of 15%. Hamon came on top in the first round of the primary, followed by Valls; as neither of the two secured more than 50% of the vote, a second round will be held on 29 January. Montebourg, relegated to third place, conceded defeat and pledged to vote for Hamon in the second round. Peillon came fourth, de Rugy fifth, Pinel sixth, and Bennahmias last. Of these four candidates, Pinel backed Valls in the second round; Peillon did did not endorse but encouraged voters to mobilize; and de Rugy also chose not to endorse immediately afterwards, hoping to meet the top two contenders on 23 January to decide. Only 7,350 polling stations were open during the primary, compared to 9,425 in the 2011 primary and 10,228 in the primary of the right. Meanwhile, Bennahmias, with just over 1% of the primary vote, did not endorse any candidate and expressed his intent to announce a decision on 25 January. An overnight update of the official primary results published 10:00 CET on 23 January added approximately three hundred thousand votes, without any change in the vote share of any candidate, arousing suspicions among observers and the French press. Two hours later, an update to the total of votes obtained by Sylvia Pinel was published, increasing her vote share by 0.01% (i.e., 160 additional votes). However, the total number of votes for Pinel increased by 161, more than the total number of overall votes, with changes to no other candidates. The results were believed to have been manipulated into inflate the apparent turnout, which was low compared to past primaries. The PS initially attributed the results to a “bug”, but later conceded that it had been a result of “human error.” However, the French press remained skeptical, noting the improbability of a nearly-identical 28% increase in votes for all seven candidates. There was also additional confusion, even prior to reports about the potential manipulation of vote totals, surrounding the number of polling stations open (which, according to PS, is fewer than 7,350 because many were merged with others) and the vagueness of PS officials on primary turnout, compounded by the fact that no comprehensive public record of primary results was published. Jean-Michel Baylet, Thierry Braillard, Jeanine Dubié, Paul Giacobbi, Annick Girardin,Françoise Laborde, Dominique Orliac, Virginie Rozière,Jean-Claude Requier, Raymond Vall, Jean Zuccarelli. Former economy minister Emmanuel Macron, who refused to participate in the Socialist primary and running for president as an independent under the banner of En Marche! Twenty-four applications were filed with the High Authority for the left-wing primary, but not all were made public; of these, several were disqualified for not securing enough sponsors under the rules of the primary. Several other individuals filed applications which were rejected as they were not members of PS, UDE, PE, or FD. France Left Primary: who are the main frontrunners? Not to be confused with Radical Party (France). The Radical Party of the Left (French: Parti Radical de Gauche, PRG) is a social-liberal political party in France. It has been a close ally of the major party of the centre-left in France, the Socialist Party (PS), since 1972. The President of the PRG is Jean-Michel Baylet and its Secretary-General is Guillaume Lacroix. 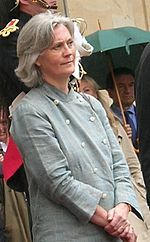 The party’s sole MEP is Virginie Rozière, who sits with the Progressive Alliance of Socialists and Democrats (S&D) group. The party’s youth wing is the Young Radicals of the Left. The party was formerly a member of the European Liberal Democrat and Reform Party. The party was formed in 1972 by a split from the Republican, Radical, and Radical-Socialist Party, once the dominant party of theFrench Left. It was founded by Radicals who opposed Jean-Jacques Servan-Schreiber‘s centrist direction and chose to join the Union of the Left and agree to the Common Programme signed by the Socialist Party (PS) and the French Communist Party (PCF). At that time the party was known as the Movement of the Radical-Socialist Left (Mouvement de la Gauche Radicale-Socialiste, MGRS), then as the Movement of Radicals of the Left (Mouvement des Radicaux de Gauche, MRG) (after 1973). Led by Robert Fabre in the 1970s, the party was the third partner of the Union of the Left. Nevertheless, its electoral influence did not compare with those of its two allies, which competed for the leadership over the left. Robert Fabre sought to attract left-wingGaullists to the party and gradually became close to President Valéry Giscard d’Estaing, who nominated him as Mediator of the Republic in 1978. He and his followers were excluded from the party by those who strongly supported the alliance with the PS. Michel Crépeau was nominated by the party for the 1981 presidential election, and obtained a disappointing 2.09% in the first round. He and his party endorsed PS candidate François Mitterrand in the runoff, who eventually won. The MRG won 14 seats in the subsequent legislative election and participated in PS-led governments between 1981 and 1986 and again between 1988 and 1993. In the 1984 European elections, the MRG formed a common list with Brice Lalonde‘s environmentalists and Olivier Stirn, a centre-right deputy. The list, styled ERE (Entente radicale écologiste) won 3.32% but no seats. The party resumed its customary alliance with the PS in the 1986 legislative election and supported President François Mitterrand’s 1988 reelection bid by the first round. At the beginning of the 1990s, under the leadership of the popular businessman Bernard Tapie, the party benefited from an ephemeral upswing in its popularity while the governing Socialist Party was in disarray. The list led by Tapie won 12.03% and 13 seats of the votes in the 1994 European Parliament election. However Tapie retired from politics due to his legal problems and the party, renamed the Radical-Socialist Party (Parti Radical-Socialiste, PRS), returned to its lowest ebb. After the Radical Party opened legal proceedings against the PRS, it was forced to change its name to Radical Party of the Left (Parti Radical de Gauche, PRG). Between 1997 to 2002 it was a junior partner in Lionel Jospin‘s Plural Left coalition. In the 2002 presidential election, the PRG nominated its own candidate, former MEP and French Guianadeputy Christiane Taubira, for the first time since 1981. However, some members of the party including Émile Zuccarelli and PRG senator Nicolas Alfonsi supported Jean-Pierre Chevènement’s candidacy. Taubira won 2.32% of the vote. Taubira gave her name to the 2001 law which declared the Atlantic slave trade a crime against humanity. In the 2007 presidential election, while the party supported the Socialist candidate Ségolène Royal, Bernard Tapie, who had been a leading figure in the PRG, supported Nicolas Sarkozy. In the 2007 legislative election the party won eight seats, including a seat in French Guiana (Taubira) and Saint-Pierre-et-Miquelon. The party split Nicolas Sarkozy’s constitutional reforms in 2008. Six deputies (Gérard Charasse, Paul Giacobbi, Annick Girardin, Joël Giraud, Dominique Orliac, Sylvia Pinel) and three senators (Jean-Michel Baylet, André Boyer, François Vendasi) opted to vote in favour, hence allowing for its passage. The PRG’s president, Jean-Michel Baylet, ran in the 2011 Socialist presidential primaries – the only non-PS candidate in the field – but he placed last with only 0.64% of the vote in the primary. The PRG supported François Hollande, the eventual winner of the primaries and the 2012 presidential election. In the 2012 legislative election, the PRG won 12 seats. With four additional members, it formed its own parliamentary group in the National Assembly, the Radical, Republican, Democratic and Progressist group (Radical, républicain, démocrate et progressiste, RRDP). The PRG advocates radicalism, secularism to its French extent known as laïcité, progressivism, European federalism, individual freedom and differs mainly from the social democrats of the Socialist Party by its strong attachment to private property. Under Baylet, the PRG’s party line has been centre-left, socially liberal and pro-European. Nevertheless, there are internal divisions in the party. 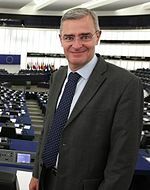 Former cabinet minister and former deputy Émile Zuccarelli is a left-wing republican, who has strongly opposed Corsican nationalism and supported the NO in the 2005 European constitutional referendum, positions much closer to Jean-Pierre Chevènement‘s Citizen and Republican Movement (MRC). Similarly, Christiane Taubira supported the NO in 2005 and endorsed Arnaud Montebourg rather than Baylet in 2011 primary. Ministers : The party has four ministers in Manuel Valls‘s incumbent government: Christiane Taubira, minister of Justice; Sylvia Pinel, minister of Housing and Territorial Development; Thierry Braillard, junior minister for Sports and Annick Girardin, junior minister for Development and Francophonie. Deputies: Chantal Berthelot (sits in SRC group) (Guyane), Gérard Charasse (Allier), Stéphane Claireaux (Saint Pierre et Miquelon), Jeanine Dubié (Hautes-Pyrénées),Paul Giacobbi (Haute-Corse), Joël Giraud (Hautes-Alpes), Gilda Hobert (Rhône), Jacques Krabal (Aisne), Jean-Pierre Maggi (Bouches-du-Rhône), Dominique Orliac (Lot),Jacques Moignard (Tarn-et-Garonne), Stéphane Saint-André (Pas-de-Calais), Roger-Gérard Schwartzenberg (Val-de-Marne), Alain Tourret (Calvados). The PRG remains rather weak on its own electorally, averaging around 2% of the vote (2002 presidential candidate Christiane Taubira won 2.32% of the vote); which explains why the party depends on its stronger ally, the Socialist Party (PS) for support and parliamentary representation. Almost all of the party’s deputies and local officials were elected with no official Socialist opposition. It retains some support among middle class voters and in traditional Radical areas in the South West. The major exception is in Corsica, where the party has historically been the largest party on the non-nationalist left and remains so to this day, due to a tradition of political dynasties (such as the Giacobbi family) and the weak infrastructure of the PS on the island. Paul Giacobbi represents Haute-Corse in the National Assembly (Émile Zuccarelli, an internal rival of Giacobbi and current mayor of Bastia also represented the island in Paris until his 2007 defeat), and Senators Nicolas Alfonsi and François Vendasi represent the Corsican PRG in the Senate. Giacobbi is also President of the general council of Haute-Corse. In metropolitan France, the PRG is able to sustain a long-lasting Radical tradition dating back to the French Third Republic, most notably in the southwest or departments such as the Eure-et-Loir and Eure. The party is represented overseas in French Guiana by Christiane Taubira‘s Walwari, one of the major parties of the local left.